As of yesterday the game Grandia is available for download on the North American PlayStation Network for $9.99 USD. 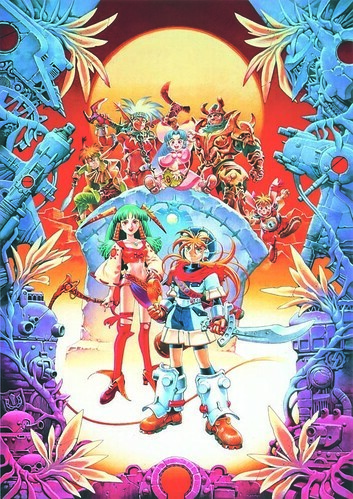 The original Grandia was released back in 1997 on the Sega Saturn in Japan only. In 1999 the game was ported to the PlayStation and released in North America and in 2001 in Europe. The story begins as Justin, who has inharited the Spirit Stone from his father that was a great adventurer. On one day when visiting the Salt Ruins with his friend Sue, they find out that the Spirt Stone is the key to the secrets of the ancient Icarians. An epic adventure follows. When the game wiill be available on the European PlayStaton Network has not been announced yet. There were some rumors going on about Final Fantasy XIII getting downloadable content, but a few days ago Square Enix has stated that they currently don't have any plans for DLC. "Regarding the DLC content, we feel that the final product is 100% enjoyable…it’s the complete package. So we’re not planning any DLC at this time. In regard to the rumored cut content, we feel it was taken out of context. There are a lot of ideas that are brought to the table, and then the team takes the best ideas out of those, and the final product is polished that way. There was content that were “ideas” that didn’t make the final content, but the team isn’t looking to release that as downloadable content." If the company decides in the future to release DLC, we will let you know. Star Ocean: The Last Hope International has been released today in the United States for the PlayStation 3. The International version features additional content such as Japanese voices and 4 other languages (German, French, Italian and Spanish). The game will be released in Europe this Friday.